"Eight Days a Week" is generally regarded as two-thirds McCartney and one-third Lennon. The songwriting team was trying to come up with a title for the film Help, which was originally titled Eight Arms to Hold You. (The single reflects this on the .45 label, which reads "From the forthcoming release Eight Arms to Hold You.") The term "eight days a week" was yet another Ringo malapropism. The track was recorded October 6, 1964 and released in the U.S. on February 15, 1965. Lennon never liked the song and said in 1980 that it was "lousy" and "never a good song." Fans have always disagreed, and the fade-in, accompanied by a strong bass line, is quite distinctive. 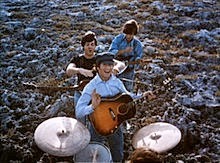 Lennon provides the lead vocal and plays rhythm guitar; McCartney plays bass and provides harmony vocal; Harrison plays lead guitar; Starr plays drums.